Today is a momentous day for YA Media Networks as the company has launched its first Media app catering to an audience who want to read the latest news from the world of technology and gadgets called Gadget Bridge. The new-age news app has everything from the GadgetBridge.com website in a fluid mobile-friendly interface. The articles written in a comprehensible format are available in a slick UI on the Gadget Bridge Android app. Simply put, it is for everyone who loves technology and gadgets. Users and readers can find everything from the latest technology trends and gadget announcements to reviews, previews, comparisons and first impressions of different gizmos that are launched or about to launch. The intuitive scroll method makes it easy for the user to go through just the headlines swiftly, and if one wants to read anything further, they can just tap the article panel and will be taken to the article written in a jargon-free manner. The categories section in the app is for users who want to follow or read about a particular gadget beat. There are over 18 categories to read from, which include Mobiles, TVs, cameras, tablets, audio or just the regular news. The Gadget Bridge app also has a special section for people who want to see tech videos and not just read. 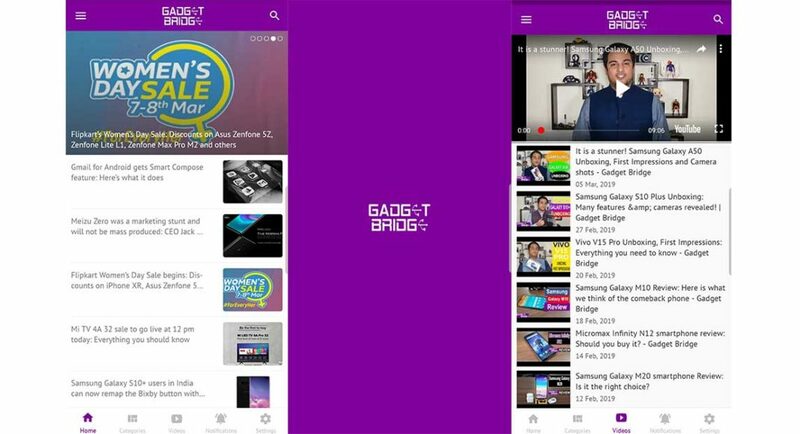 Integrated with Gadget Bridge’s YouTube English Channel and player within the app, users and viewers can see the latest videos coming from the Gadget Bridge video team. For readers who would want to hear the article on the go or are working/doing something else at the same time, can just tap the speak button on the article page within the Gadget Bridge app and the voice assistant will start to voice read the article to them. Gadget Bridge App availability? Where to download from? The app is available in over 144 countries worldwide, India being the primary one. The App can be downloaded from the Google Play Store. For the latest gadget and tech news, and gadget reviews, follow us on Twitter, Facebookand Instagram. For newest tech & gadget videos subscribe to our YouTube Channel. You can also stay up to date with the Gadget Bridge Android App.